St. Augustine has long attracted and inspired artists with its historic, coastal and architectural beauty. We spoke with two artists participating in the 2018 Plein Air Paint Out, to learn their methods and inspiration in the nation’s oldest city. Mary Hubley is a coastal artist based in St. Augustine. Florida. Her paintings are about living at the seashore, walking the beach, and breathing salt air. Profiled in the “Best of America Artists” books, she gives classes and workshops, does frequent plein air painting, and sells her work through prominent Southern art galleries. See more at maryhubley.com. Paul Ladnier, Professor Emeritus, University of North Florida, Jacksonville, Florida, taught painting and drawing for more than forty years. The recipient of many awards, he has participated in numerous group shows and is an invited artist to many plein air competitions and events, including the prestigious Publisher’s Invitational. Paul continues to paint, exhibit his works, teach privately, and conduct workshops in plein air painting and figure drawing and painting. Q: Tell us about your artistic style and process. What goes into making a piece like you are creating for the Plein Air Paint Out? A: I do plein air painting once a week. The rest of the time, I paint full-time in my studio. 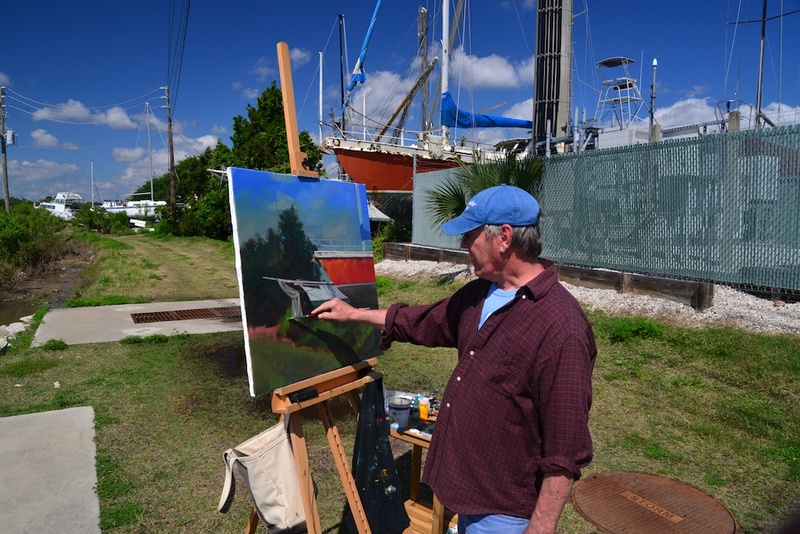 Plein air – painting outdoors – is an essential part of my process. Without this discipline, I wouldn’t be able to capture shadows and colors properly. It’s also a pleasure being out in nature, and the experience becomes part of my art. Feeling the sun and wind, and tasting the air creates a loose and soft artistic style. I start by finding a great location. Once I find the place, I set up my plein air gear. I paint in oils, and begin with a sketch, block in shapes, and work from dark to light. I spend most of my time carving out the composition, shapes, and value. A: My style is somewhat impressionistic, but generally adheres to the tenets of many of the great landscape painters like J S Sargent, Camille Corot, Edgar Payne and Winslow Homer to name a few. Plein air painting always depends on many factors such as weather, light, time, organization and choice of the right site. When I find the right location, I spend a few minutes planning the painting and then try to go directly to the solution. It may be necessary to wipe the painting out and start over – and at other times, magical things can happen. Ultimately, it is an artist’s interpretation of a specific place and time. The more convincing the interpretation, the better the painting.